Use an actual Minecraft sword to control the character onscreen. When you swing the sword the sword onscreen also swings. I am able to load the Basic_I2C Arduino sketch and I am receiving data. The only data I actually need is the heading and it seems that the magnetometer doesn't work very well. I only get a heading of about 190 degrees to 215 degrees when I rotate the stick 360 degrees. I even tried severing the default magnetometer address to use the secondary with no luck. Could you explain how you set up the FreeIMU software (https://github.com/mjs513/FreeIMU-Updates) for the calibration demo you showed on the video in this page? 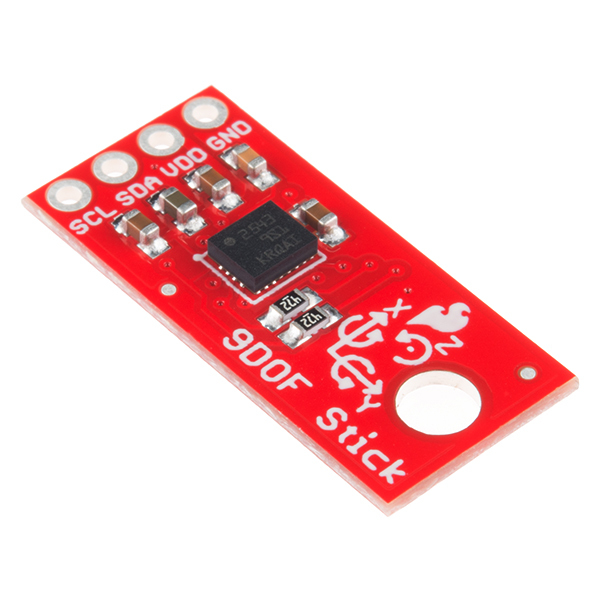 I am currently trying to set this software up for this sensor stick but I am running with some problems with the GUI. Given the on board processing, what is the time delay between actual change in motion/position and when it shows in the signals? Is it possible to configure it to use interrupts over I2C? Does it need a logic level converter to work with an arduino uno R3? Also, which are the VOL, VOH, VIL and VIH from this board? No, it doesn't need a logic converter. I've tested it on a 5V Redboard and because I2C uses open drains on the I2C lines, you won't damage the controller using 5V logic. Just be sure to use 3.3V as the power source. Can you please post the actual dimensions of the board? A photo of the board next to a quarter on its side gives a general idea, though not as good as your usual method of depicting devices next to a ruler. Neither, however, is quite so accurate (nor so easy to list) as the actual dimensions. If one has these, the photos are superfluous. Sorry about that. Alex's dimensions should be correct, although you can always check the Eagle files as well. While this is a pretty simple board the Eagle files work much better for things like finding the distance between the edge and a mounting hole, or a connector, etc. So if you ever need dimensions that is another option. Sorry about that 23Arts. The board dimensions are 0.400" wide by 0.900" in legnth. Yes the silk reference is correct with the exception of the X-Axis on the magnetometer. For some reason the X-Axis is reversed, but both the Y and Z are axes as well as the other 6 degrees match the silk. 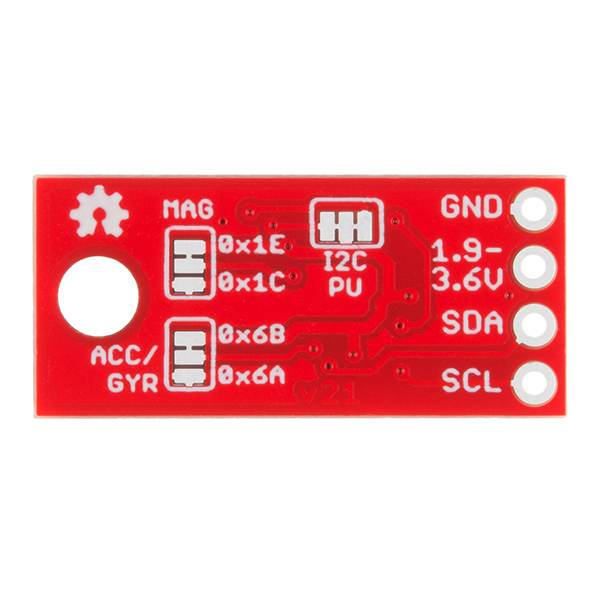 How does this compare to the MPU-9250 https://www.sparkfun.com/products/13762 (looks like it is the same price)? Both boards are very similar. The main difference comes from the magnetometer. 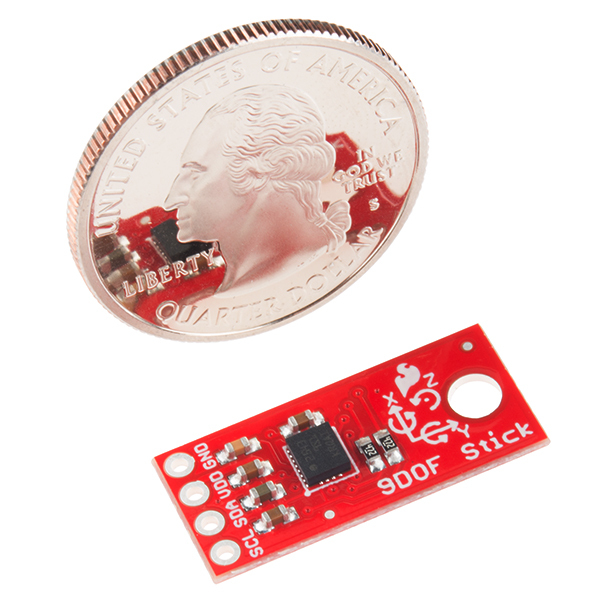 In short, the MPU-9250 can measure stronger magnetic fields than the Sensor Stick. The MPU-2950 has a sensitivity of Â±48 Gauss, while the LSM9DS1 (used on the Sensor Stick) has a configurable sensitivity of Â±4/Â±8/Â±12/Â±16 Gauss. I believe both return a 16-bit value, so while the MPU-2950 can sense a higher magnetic field, the sensor stick is more sensitive. I had the old sensor stick with the LSM9DS0, which unfortunately broke recently. Can I replace it with this board and use the same libraries? Unfortunately not. But we do have a hookup guide and the Arduino libary should make updating your code a little easier. RTIMULib should also work with this board connected to a Linux box (Pi, Edison, etc.). Mr. Google will tell you where it is. I have been working with it and its amaizing the easy-to-use sensor. The IMU has been working just fine. I do wish their was protection against over voltage and even reverse voltage as that seemed to be the only weakness experienced with my students. But that statement can apply to many other parts too. All around a good device for a very nice price. Only its accelerometer and gyroscope is very accurate in getting rotating around X and Y but the heading of compass is really bad. It makes me very crazy because of false readings of manometer as it can be effected by any close magnetic filed and give you completely wrong values. But the good thing is its small size, but i won't buy it again if i want to make application depending on compass. 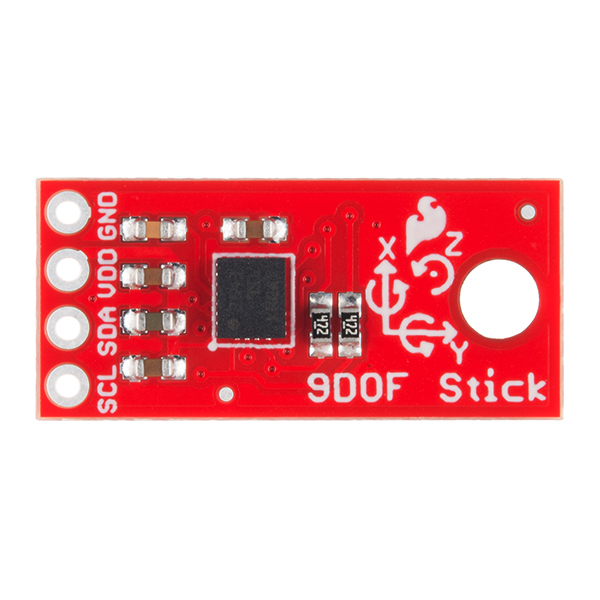 Sorry to hear about the issue with the 9 DoF sensor stick! Have you contacted our technical support @ techsupport@sparkfun.com? They're usually very good at helping figure out if a board is behaving out of scope and troubleshooting problems that may be going on within a setup. Hooked this unit up to my Red Board and can't seem to get the heading indication to work much at all. I'm looking to get some help from tech support after Cyber Monday but if anyone has recommendations regarding magnetometer calibration and if any code correction is needed I'd love to hear form you. Heading seems to be mostly unresponsive to z-axis orientation. I get its cheap, but this stick broke within a couple minutes of use. The fiberglass is no more than 0.030" thick, and I would not be surprised if a little bending load broke the joints on the chip. Works extremely well and gives accurate readings. Could use more in-depth documentation instead of needing to read library code.